Tower Hamlets Council has been rightly praised by the likes of Stonewall for its gay-friendly workplace policies. However, the council is not the borough. The area around Spitalfields and the Shoreditch boundary is home to a growing and vibrant gay scene, but there is also a dark side. According to figures from the Met Police, a homophobic crime is committed in Tower Hamlets at the rate of more than five a month. I suspect the true level is much higher. The gay community around Brick Lane frequently worry about being abused or attacked. Some of that abuse comes from idiots handing out leaflets outside the Whitechapel Idea Store or the East London Mosque (the mosque itself condemns such actions). And today, this poster has just sprouted around the Hanbury Street area of Spitalfields and Whitechapel. A friend spotted one on the entrance to the Brady Centre and several more on lampposts and other street furniture along Hanbury Street. One was also on the door of Davenant House on the Chicksand estate. 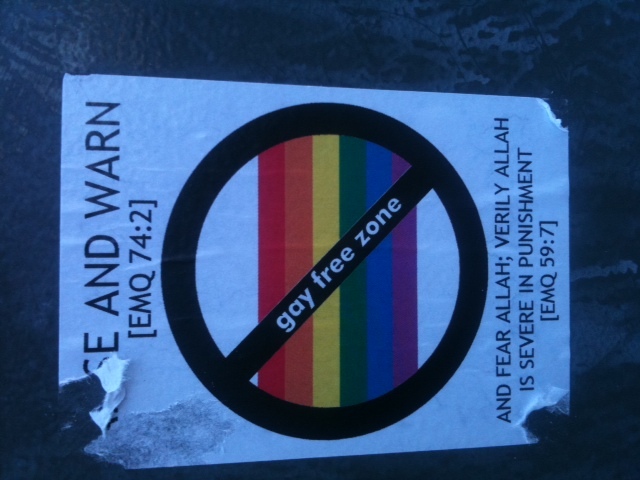 The posters say “Arise and Warn” at the top and declare the neighborhood a “gay free zone”. Sinisterly, they say if not, “fear Allah” and risk punishment. He removed most of them and is reporting them to the police. He’s also worried; he didn’t want me to publish his name for obvious reasons, but said: “It’s very serious and really worrying for us. There are lot of gay men and women who live around here. If anybody sees any more of these posters, do please let me know. I’m being told that more of these posters appeared this morning outside Swanlea School in Brady Street, Whitechapel. They’ve also now been removed. The Association of British Muslims has now condemned these leaflets and has asked Peter Tatchell to intervene.